Note: This article was first published in The Commons. 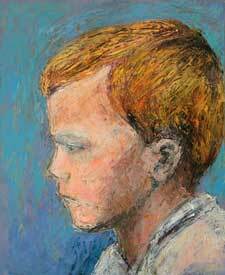 EDITOR'S NOTE: Opening on Gallery Walk at River Gallery School this month is an exhibit of Lori Schreiner's paintings and some of Theresa Senato Edwards' companion poems from the book "Painting Czeslawa Kwoka: Honoring Children of the Holocaust." Schreiner will be on hand to meet the public and sign copies of the book from 6 to 7:30; she is planning to do a short reading at about 7 pm. For most of us, looking at photographs from the Holocaust would be painful and difficult, something to turn away from. But when Lori Schreiner had a chance encounter with such a photograph on a back page of the New York Daily News, it changed her life. 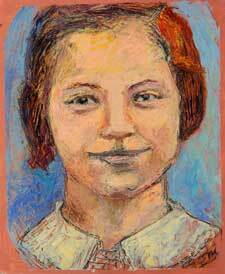 She found in the photograph of a Polish Catholic teenager, Czeslawa Kwoka, a compelling call to give witness. 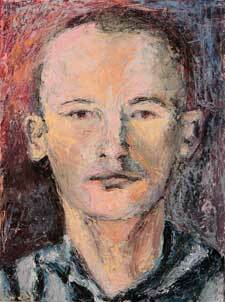 She would spend time over the next four years using palette knife, fingers, and paint in response to the photographs of Wilhelm Brasse, a Polish political prisoner who documented those coming into Auschwitz, and photographs from the archives in the Holocaust Museum in Washington, D.C., and Auschwitz-Birkenau in Poland. "Painting Czeslawa Kwoka" is also a collaboration with poet Theresa Senato Edwards. At the time of its inception, 2007, both women were students in Goddard College's low-residency master's program. Edwards submitted the project for her thesis, which consisted then of four paintings of Kwoka and a five-part poem inspired by the paintings. Over the ensuing years, Schreiner would produce twenty-four paintings based on the photographs of Brasse and the Holocaust Museum archives. Sixteen poems accompany the paintings. Additionally, as part of the project, Schreiner and Edwards gleaned what information they could about the children from records at these museums. While the project is far-reaching in its subject matter and message, it was "birthed" locally. The first painting, and all subsequent ones, were created at the River Gallery School under the tutelage of Ric Campman and Lydia Thomson. Schreiner recalls that Campman exhorted her, "You have to get these out!" Says she, "He had never said anything like this to me before. He died a month later." Thompson relished having the paintings up on the River Gallery School walls as the project progressed. "From the first time I worked with Lori on these paintings, I realized that what she was doing was important and deep. What was coming through was authentic and direct. I felt it was a priviledge to have these paintings happen here." Thomson described the experience stepping back from the work in progress: "We were both speechless. It was a surprise to Lori as much as me." For Schreiner's part, she said she loved being able to put the paintings up as she worked, sharing the project that way. Each finished painting was sent digitally to Senato Edwards for her poem response. What Schreiner seems to have been striving for, and indeed achieved, is less a copying or even transposing a photograph into the medium of paint, than an attempt to let the spirit of the child come through. Says Schreiner, "It was a profound experience. I would be present with the photograph and be open to their energy." Features are sometimes blurred, but the paintings and their subjects have a powerful presence. They are amorphous yet powerful, like someone to whom you are strongly connected perceived in a dream. I asked Schreiner why she thought this project took hold of her as it did. We got into a discussion about memory at the cellular level. She grew up in a family that left Germany in the thirties -- her mother from a family of German Lutherans who came over as political dissidents. No one spoke about the past. But she grew up with a silence, says Schreiner, that had its roots in shame. Three of her relatives in Germany were killed by American bombs, though most got out. "My great grandfather on my mother's side was a politician. They were against the Nazi regime but they loved 'the homeland.' There was great internal conflict." Her family has been very supportive of the project, says Schreiner, and many family members came to a book-signing she did on Holocaust Remembrance Day this past April, in Poughkeepsie, New York. "It has been very healing for my family because of all the shame and loss." In a sense, "Painting Czeslawa Kwoka" is what Schreiner has been working on her whole adult life. A social worker for three decades, she says, "I think I came to this work out of my own evolution in my personal work, my family history, and my understanding of the impact of trauma that I have learned from my work in the social work field for 31 years, for the most of this time working with children and families." "Painting Czeslawa Kwoka" has gone on to win BleakHouse Publishing's Tacenda Literary Award for best book of 2011. Besides the book-signing at River Gallery School, there will be signings and readings forthcoming at St. Mark's Church in New York City, noted for its literary history, and at American University for a class using the book as one of its texts. Though I wish the book were in a larger format, taking its place in the world with a presence that is commensurate with its emotional impact, "Painting Czeslawa Kwoka: Honoring Children of the Holocaust" is a remarkable document of a remarkable and brave journey.